The central Institute of Indian Languages from its very inception in 1969 has been working in theoretical and applied aspects of linguistics in its headquarters at Mysore and its seven Regional Language Centres located at Mysore, Bhubaneswar, Pune, Patiala, Solan, Lucknow and Guwahati. The main function of the Regional Language centres is to Impart in-service training to graduate teachers in 13 major Indian language other than their mother tongues with the expectation that the trained teachers should be able to impart Instruction in such language learnt by them to school children under scheme of implementation of three language formula. The task is tremendous in that it necessitates a very thorough and Intensive training including languages teaching methods, preparation of language instructional materials, techniques of evaluation and testing and the life. In fulfilment of this responsibility the Institute has been undertaking the preparation and publication of a series of Phonetic Readers Grammars and Dictionaries in the tribal languages and other series of second language teaching materials in 18 major Indian Languages which include script books, pictorial glossaries, common vocabularies, Intensive courses, Intermediate and Advanced course readers and school level language primers. 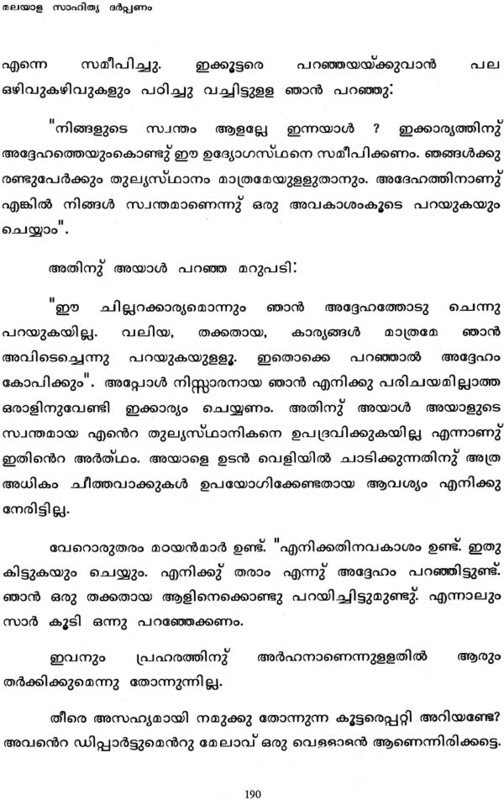 The present book entitled Malayala saahitya darppaNam" is the Advanced Course Reader in Malayalam. It aims at giving the learners an overview of the literature of Malayalam. Due to the paucity of time avilable at the advanced stage of learning, the writer, Dr. V. Saratchandran Nair has restricted to the major works in Malayalam literature. However he has carefully chosen pieces of prose, poetry drama, travelogue, humorous essays etc. of the reputed writers of Malayalam literature. In addition the representing various literary system and rich diction, these literary pieces present the cultural background of the people of Kerala. The author has also prepared various kind of exerscis both subjective and objective with would enable the non-native learner to sharpen his language and literary skills. Elaborate cultural notes and background information regarding each lesson is also provided wherever necessary. It is hoped that book will meet the needs of the learners of Malayalam as a secondary level teaching under CBSE courses. The editor, the supervisor and the Institute will feel rewarded if the book is well received by the learners and teachers of Malayalam. The malaayala sahitya darppaNam' an Advanced Course Reader in Malayalam is to be used as class room teaching/ learning material for the teacher trainees of the Southern Regional Language Centre, CIIL, Mysore. 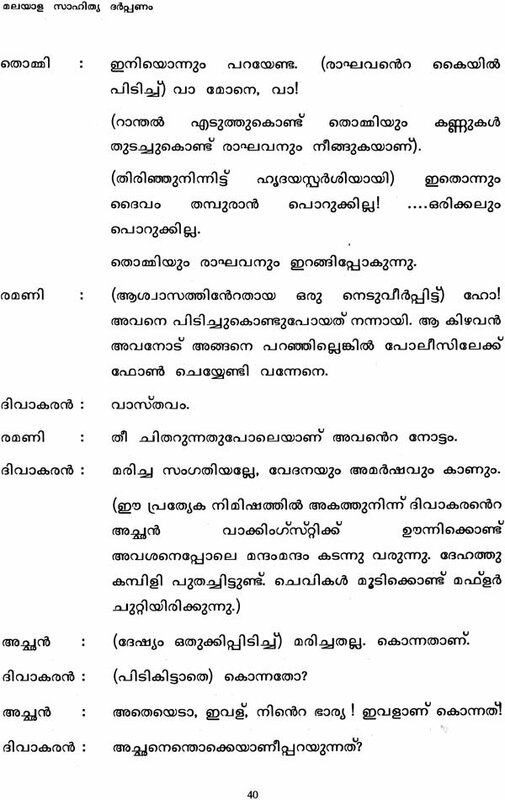 This text is to be used at the advanced stage of the ten month's Intensive Course in Malayalam. 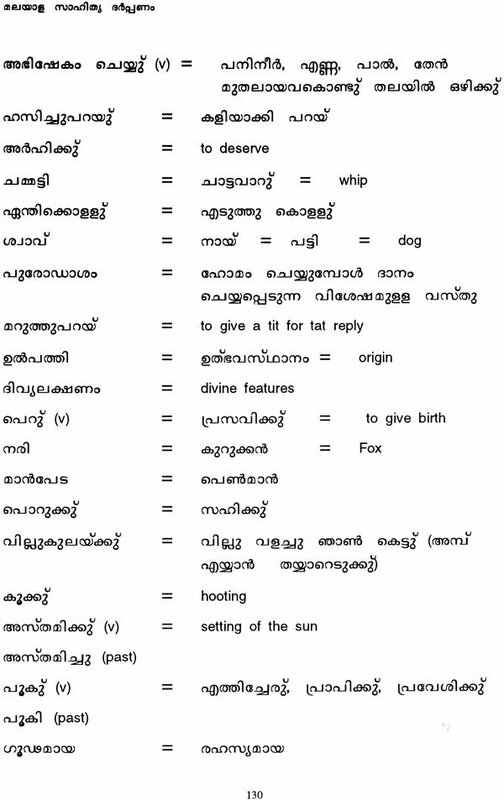 It could also be used by any learner of Malayalam at a later stage of his/her learning the language. Learning a language at the advanced stage in a total intensive programme involves sharpening the skills already achieved at the basic and intermediate stage and also developing the creative faculty in the learner. What are the priorities of learning the language at the advanced stage? It is expected that (i) the learner should be made to develop an interest in the literature of the target language appreciate the literary works of the target language and kindle in him an urge to know more about the literary trends in the target language (ii) the learner should be to utilise the skills already learnt at the lower levers (iii) the focus should be to exploit the thematic content and language of the material available and extend it further. For instance teaching poetry could be utilised for various purposes; (i) it could increase the learner's vocabulary, both current and archaic (ii) create sensitivity to rhyme and rhythm, which would help comprehension (iii) since poetry uses repetition and alliteration it could be remembered very easily. 1. Selection of the Passage This reader consists of literary from Malayalam literature, which are suitably selected for heterogenous group of learners of Malayalam, whose mother tongue could be Hindi, Oriya, Kannada, Assamese, Tamil etc. The age-appropriatness of the learners and their interest were also kept in mind while selecting the passages. It includes short-stories, poems dramas, travelogues, essays etc. mainly from the modern period, reflecting the different trends of literary development in Malayalam. The logical coherence of the events in the passages, the level of understanding of lexical items, the syntactic constructions, the concepts underlying the passages were also taken into consideration while selecting. All the lessons have been tried out during various academic years and found to be suitable. 3. Notes and meanings of words are provided in Malayalam and English with elaborate explanatory notes on cultural aspects wherever necessary. 4. The grammatical categories such as Noun, Verb, Adjective or Adverb are marked for each word. Since past tense formation in Malayalam is a complex area and difficult for the learner, very entries are provided with the past tense also. 5. Always contextual meaning is provided. Sometimes it is supplemented with literal meaning also. Sometimes binary opposites are provided. 6. While explaining the meaning of a poem it was found that in a second language teaching situation which we have adopted, the splitting of sandhi is very effective. Hence the glossary consists of segmentation of sandhi wherever felt necessary. Experience and try out of the material has shown that learners are able to analyse other poems and understand them. 8. For better understanding of the lessons, the literary pieces are categorized into different sections and, wherever felt necessary, comprehension questions are framed accordingly. They are of various types, both objective and open-ended. Questions eliciting critical evaluation or literary appreciation are also included. In certain lessons, question on summary/precise writing are also included. Paraphrasing is an activity which is included after all the poems. From my class room experience, while teaching the advanced course, several learners have often raised questions regarding analysis of a word or the semantic range or the semantic nuances between words and hence a new type of exercise is incorporated in the present book. This activity definitely requires that the learner has to consult a standard dictionary in Malayalam and he is encouraged to use the dictionary. For example, the learner comes across a word in Malayalam as /kanagaNam/bangles' and he would be curious to know the names of ornaments which are worn around other parts of the body. The words for bracelet, waistlet, armlet, ear ring, necklace are to be traced out by the use of dictionary is one type of exercise. So the word exercises that are included are word – formation processes, word association, binary opposites etc. word exercises could be at the morphological level, syntactic level and semantic level. These kings of activities would definitely enrich the vocabulary of the learner. At the advanced stage the crucial problem of using the appropriate words at the appropriate context could be tacked. If these exercises are fully utilised it would go a long way in fulfilling the need of the learner. Full utilisation of the learning material would depend on the home work done by the teacher. It is expected that the teacher the good with limited time at his disposal. In the present course it is expected that the entire gamut of Malayalam literature and its various literary trends are to be presented in a nut shell. So each lesson would represent a certain period. Various genres of literature have to be highlighted. In order to achieve this the teacher is expected not to commence teaching the lesson directly but trace the development of short stories, dramas, poems as the case may be, Later introduce a brief historical account of the author, his other literary works, his significant contributions etc. this would enable the student to capture a wholistic view of Malayalam literature. IV. Suggestions to the learner. Since learning the language at the advanced course turns out to be more learner centred, it is expected that the learner utilises the short time at his disposal usefully. The learner is expected to refer/read other literary works of the author, consult dictionaries, read criticism of the stories or poems taught in the class. This would enable the learner to appreciate the literature effectively and efficiently. It is essential that the learner fully utilises the exercises provide at the end each lesson.